Years ago, I was riding a pasture up in Beaver County, Oklahoma. Our ranch mutts, Foxie and Pooch, went along with me, as they usually did, following along behind my horse and doing the usual dog-things. All at once I noticed something odd. We were passing through some tall sagebrush. The dogs were jumping up into the air and looking back towards the country we had just crossed. I had never seen them do that before. The next thing I knew, the dogs were right beside my horse, and were even getting under his legs. Now, that was odd behavior, so I stopped my horse and looked back. There, staring at us through the sagebrush, was a coyote. He had been following us. My dogs didn't know what he had in mind, but they wanted no part of it. One of the most interesting animal relationships on a ranch is the one that exists between coyotes and dogs. Coyotes belong to the dog family. They look like dogs. They can bark like dogs and sometimes they seem as playful as dogs. But they aren't dogs, and sooner or later every ranch mutt figures that out. Along towards evening, the coyotes come out of their dens and set up a howl. Actually, the word "howl" doesn't begin to express the variety of sounds they make. Sometimes they howl and sometimes they bark, and sometimes they make eerie, tormented screams that almost defy description. Our ranch dogs always hear the coyotes, and they always make some kind of response. Their reactions vary. Sometimes they go ripping away from the house and set up a barking position somewhere between the coyote and the house. Sometimes they stand their ground and begin rumbling uneasy growls. Other times they slink away to safe corners of the porch where they resume their growling and muttering. From my human perspective, it appears that dogs are fascinated by their wild cousins. On the one hand, dogs are curious and attracted to them, but on the other hand, they seem to understand that these wild cousins are bad guys and not to be trusted. It is hard to know what coyotes think of dogs. I have seen them play with dogs, when they appeared to have no hidden motives. But for every story about dogs and coyotes playing together and having fun, there are dozens that have more serious consequences. 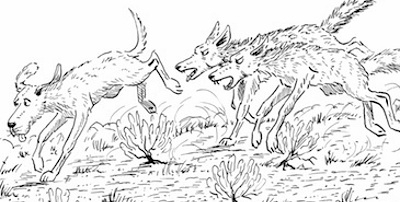 Coyotes will often lure an unsuspecting ranch dog out into the pasture, then attack him, thrash him, and send him back to the house with scars—and with a new understanding of coyotes. Stories coming out of suburban communities indicate that coyotes are staying fat and sleek by stealing dog food, and sometimes the dogs for whom the food was intended, usually poodles or other toy breeds. Coyotes, it appears, have no hang-ups about cannibalism. In my Hank the Cowdog stories, Hank is attracted to the coyotes because they live adventurous lives. They revel in the joy of being uncouth, ignorant, and irresponsible. Hank likes that, and every now and then he feels the urge to quit his job as Head of Ranch Security and join up with them. But he is also aware of the danger of being in their company. They are always trying to eat him, and that does complicate a relationship.